WiFi can be notoriously bad at traveling distance and often require extending or boosting a wireless signal to get better reception. 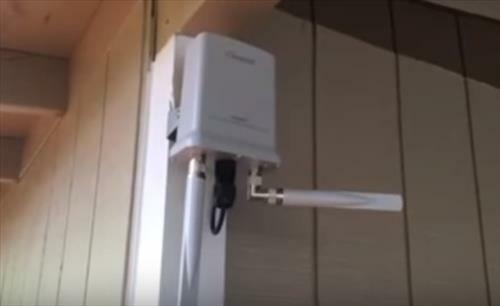 Extending an outdoor wireless signal with a WiFi range extender can be easily done with the right unit. Every outdoor wireless environment will be different, some can have trees blocking a signal, other times a street or alleyway requires a wireless bridge since no wires can be installed. Many scenarios require transmitting a WiFi signal to a garage or neighbors house. Since there are so many different outdoor wireless scenarios here we list our picks of options to help you get the most from your WiFi setup. 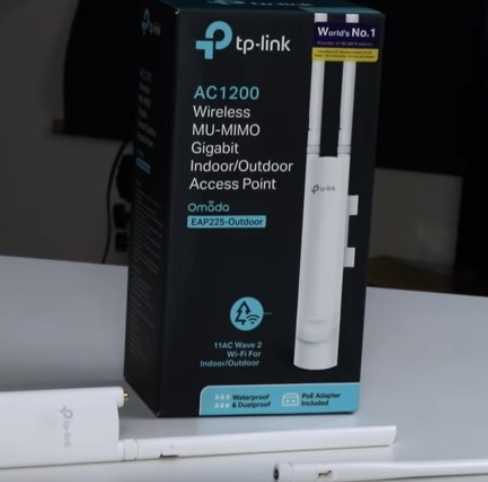 TP-Link makes many good wireless solutions including the EAP225 Indoor / Outdoor Access Point. It can be mounted outside high-up and along with two large antennas transmit and receive a signal greatly extending the range. 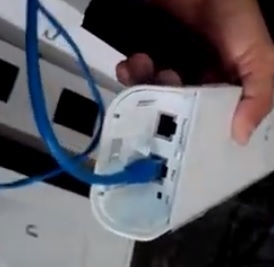 The back of the unit has as a waterproof cover that an Ethernet line is run to from the router. It is a PoE unit that receives power from the Ethernet line with a PoE adapter that is included. The AC1200 unit works in both the 2.4Ghz and 5 GHz frequency along with the new 802.11ac WiFi protocol. Since it is dual band 802.11ac unit it will fit into most any network and be able to talk to both old and new devices. The Ubiquiti Nanostation NSM5 is a PoE step-up that transmits in the 5Ghz range. It can extend or boost a WiFi signal to great distances with two sets transmitting and receiving a wireless signal. The NSM5 can also be setup in many other WiFi environments including as a bridge, but its main use to to keep extending a signal by adding additional units. The basic installation is setting two units in-between two buildings and running an Ethernet cable to each from a router. The signal from one building to the other will transmit and receive extending an internet connection. Hawking Technology is a company that has many outdoor wireless solutions. The Hawking HOW17ACM is one such solution and is a dual band range extender so it works in both the 2.4 GHz and 5 GHz frequencies. It is also uses the new 802.11ac protocol making it a universal repeater able to fit into most any WiFi network. The 802.11ac protocol also called Wireless-AC has much faster data transfer speed than the older Wireless-N protocol. The Hawking HOW17ACM is a high-end unit built for transmitting at big distances and os likey overkill for most home wireless set ups. Setting up a WiFi range extender can be confusing sometimes. Most manufacture try to make the setup as easy as possible but some skills will still be needed. If you have no background in setting up networks be sure to read a basic wireless network setup article or watch a YouTube video to get the basics. Also be sure to know type of router you have as your network interface to the internet. Older routers only worked in the 2.4 GHz frequency while new routers work as in both 2.4 GHz and 5 GHz band called dual band. 5 GHz frequencies don’t travel as far as 2.4 GHz signals but 5 GHz is not a crowded environment as the older 2.4 GHz range is. Most devices transmit at 2.4 GHz which can cause problems in crowded areas since when two signal collide the transmission must be resent slowing down the entire network. For this reason if your network is in a Urban setting than 5 GHz frequency likely will be better. If you live outside a city in a less congested WiFi area than 2.4 GHz is likely better. Great video. Can “B” station broadcast wirelessly or do you need to physically connect to it? please help me as i have internet connection at my home, my brother living away 300 meters there is very poor signal. so please suggest the solution ..
Did anyone ever respond to this? I have same question. I need an extender (not an access point) that doesn’t need to be plugged into PoE or router. I want it to pick up wireless signal and boost it. That Wavlink AC600 requires an ethernet cable to run to it. So that’s not what you’re looking for. I’ve had good success with the D-Link DAP-1520. Dual-band, good range. I use it for my front patio. Small box, plug in the outdoor outlet, or inside out let near the window nearest your outdoor area. Once it’s configured, you can plug it in when you’re out there, unplug it and dump it in a drawer when you’re not. It comes up about 15 secs after it’s plugged in, once it’s configured. This is NOT WEATHERPROOF but who wants to sit outside in the rain. I am trying to understand how these range extenders work and a lot of it is Greek to me. What I am simply looking for is a way to extend a strong signal to my barn (approx 150′ away.) I get one bar or no bars in the barn. Do these extenders need to be wired with network cables and/or power outlet? Where would I mount it outside? Thanks, very educational video. What I am going to ask is that, where can I get a device as such you are using or perhaps one that which is better than it. I live in Toronto, Canada and I am in need to connect two homes which is approximately about 800 meters apart. Where can I purchase such? Would the Source have it? Hi,looking for an external extender.Need something that will extend my wifi signal via satellite broadband from one house to another about 150mtrs away. TRy to use Tenda AH302. it can connect wifi 300 mtrs away from the source.. I own a Guest House business, I have two guest houses across the road from one another, I am currently using an ADSL line for internet which i provide to the guests free of charge, the Router is in the one guest house, I am looking for an extender/repeater which can send strong signal to the second guest house, the distance I plan to cover is about 350m to 500m, what is the best device to connect to my current router? Please try Althai super wifi, it may reach about 1k for Line of sight and 500 meters for non Line of sight. I HAVE A PROBLEM MY SELF MY FRIEND. 2 MILES. WHEN I BOUGHT THE BLACKVUE DR650S INCAR CAMERA’S I WAS TOLD THAT I COULD WATCH MY CAR ON A APP ON MY PHONE. BUT THATS NOT THE CASE AS THE WIFI SIGNAL ONLY REACH ABOUT 20 METERS. THE DASH CAM IS A WIFI GPS CAMERA COMES WITH A APP YOU DOWNLOAD TO A IPHONE OR ANDROID PHONE. ONLY WORKS 20 MTERS FROM THE HOUSE WERE THE CAR IS PARKED.MY CAR IS PARKED AT MY MOMS HOUSE ON THE DRIVE WITCH IS ABOUT 2 MILES AWAY FROM MY HOUSE I LIVE IN A BUILT UP AREA WITH TREES. HAVE YOU GOT ANY IDEAS FOR ME TO CONNECT MY WIFI TO MY CAR OR MY MOMS WIFI AND THEN TO THE CAR ON THE DRIVE BELOW? IF THERE WASNT ANY TREES IN THE WAY I COULD PROBERLY SEE MY MOMS HOUSE. PLEASE HELP ME SOLVE THIS PROBLEM IF YOU CAN CRIS. Thanks for the insightful and well-organized video. It was a huge help.